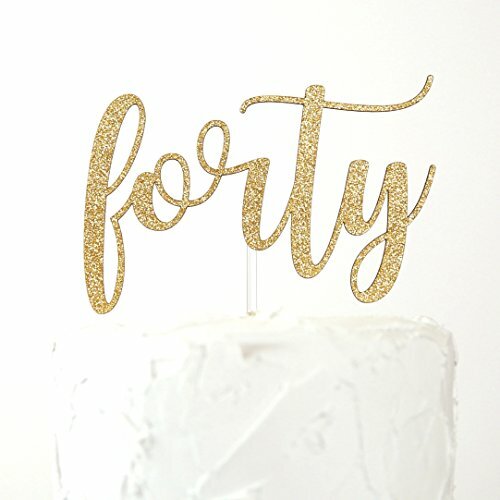 'forty' cake topper in whimsical cursive lettering design. It is made with high quality glitter cardstock that will not shed. The cardstock is permanently laminated on BOTH SIDES of a thick chipboard (paperboard). The laminated board is then laser-cut, so there is no overlapping among the layers of materials. This gives our cake topper the desirable quality, thickness, and durability while still being affordable. Our cake topper can be used multiple times for photo shoots and the birthday party itself by simply wash the food-safe clear acrylic stick (the design itself is NOT waterproof). The second image shows how the cake topper would look comparing to a 6 inch round cake. It will look nice for up to 10" cake. An acrylic stick is 5/32" diameter, 6" long which will give a flexibility of adjusting the level of the topper. It is attached on the back of the design. Furthermore, the acrylic stick is very clear so it will not provide any distraction on your cake decorations. If you have any questions about this product by NANASUKO, contact us by completing and submitting the form below. If you are looking for a specif part number, please include it with your message.